Figure 1. Analysis of the Wilms' tumour epigenome. (A) shows a region of long-range epigenetic silencing (LRES) on human chromosome 5q31 identified by human genome promoter arrays. (B) Clustered paralogous protocadherin genes at chromosome 5q31 are hypermethylated in Wilms' tumour. As well as genetic lesions, cancer cells also acquire defects in regulating levels of gene expression, which can lead to their enhanced survival and inappropriate growth. Epigenetics is a key mechanism for regulating gene expression levels, and is dependent on modification of DNA and chromatin by reversible enzymatic modifications such as methylation. My group are using genome-wide epigenetic analysis of cancer cells to identify novel tumour suppressor genes and oncogenes that may, when deregulated, contribute to tumorigenesis. The functions of proteins encoded by deregulated genes, such as the protocadherins shown in figure 1, are also assessed as this may lead to new therapeutic strategies for cancer in the future. In addition, we are also interested in the developmental functions of such genes within the kidney. We are also investigating novel drugs that may be utilised in the treatment of neuroblastoma, a paediatric cancer with poor prognosis. By modulating the epigenetic machinery, such drugs may be effective in driving differentiation and/or cell-death of cancer cells (see figure 2). Figure 2. 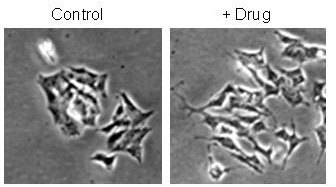 Differentiation of neuroblastoma cells induced by drugs modulating the epigenetic machinery. The treated cells (right panel) show neurites indicative of differentiation.